And yet she’s still on Twitter and Instagram. So logic, not. Democratic New York Rep. Alexandria Ocasio-Cortez said in an interview Sunday that she will no longer be using Facebook because social media poses a “public health risk,” though she will retain her accounts on Twitter and Instagram. 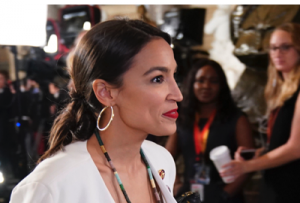 Ocasio-Cortez has used social media significantly to her political advantage thus far, but she announced Sunday in an interview with the Yahoo News podcast “Skullduggery” that she will no longer be using Facebook, according to WaPo. Her campaign is still running Facebook ads, the Washington Post reports. “I personally gave up Facebook, which was kind of a big deal because I started my campaign on Facebook. And Facebook was my primary digital organizing tool for a very long time. I gave up on it,” Ocasio-Cortez said to Yahoo News. Facebook is rapidly losing popularity with young people and teens, with only about 50 percent of teens using Facebook in 2018 according to a Pew Research Poll. Conversely, about 72 percent of teens used Instagram in 2018, 69 percent used Snapchat, and only 32 percent of teens used Twitter.